Deadlifting rocks in our natural environment, after a morning spent learning about gait. It was. Worth it, that is. The overall experience was overwhelming and enlightening at the same time. My “a-ha” moments were all over the place. I picked up lots of great little nuggets that I can’t wait to share with clients. I learned valuable information to apply to my own body. And I met some great people who’ve each left a unique impact on me. Here are my five biggest takeaways. 1.Most of us need unclumping. One of my first a-ha moments as a fitness professional was when I learned (about three years ago) how to differentiate my ribcage from my pelvis. Untucking your tailbone does not necessitate thrusting your ribs. Dropping your ribs does not mean to tuck your pelvis. This sort of unclumping needs to happen in a lot more places than we might realize. For instance, can you keep your scapula protracted and externally rotate your shoulder? Can you lift your big toe and keep the other toes down? Can you stand on one foot and relax your quads? And you thought patting your head and rubbing your belly was hard! Unclumping is super important because it allows us to moves parts of us that otherwise would seldom be moved and helps us reduce unnecessary tension in the body. 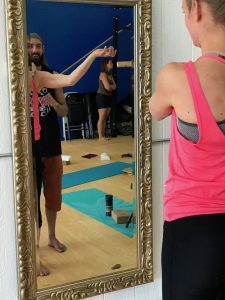 Slightly changing the angle of your foot, rotating your shoulders a different way, putting pressure on the balls of your feet instead of your heels—these are all simple ways to change up an exercise or a stretch in order to achieve a slightly different outcome. Details matter. If you stretch your calves every single day, but only ever do so with your toes straight forward, you’re neglecting to reach muscle fibers on the inside and outside of your calf. Same goes for stretching your hamstrings in the exact same plane. And if you only ever keep the same exact angles for exercises and stretches, you won’t be very successful at unclumping. Working on “unclumping” and finding neutral scapulae with RES instructor Michael Kaffel. 3. Stress less about what a client feels when you first give them an exercise. Let me first say that I think it is very important to help clients understand the why behind an exercise and help them do it in a way that accomplishes this goal. However, just because someone does not immediately feel what they “should” feel doesn’t mean an exercise is a waste of time. I think glute exercises are a great example of this. It is so tempting to tell someone to do clamshells because they’re a surefire way to feel the gluteus medius working. (Feel the burn!) On the contrary, you could set someone up in a pelvic list and they might not feel their glutes working at all. It’s OK! Be patient, continue cueing them into good alignment and allow them to feel what they’re feeling (as long as it’s not pain). Some of the most worthwhile exercises take the most practice and awareness. Also, you can’t walk by clamshelling your way down the street. 4. If you can’t do it, bolster it or break it down. 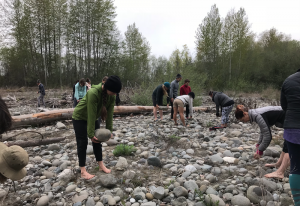 No matter how complex a movement or a stretch may be, you can find a way to teach it. Bolstering may mean a client doesn’t get to perform the full range of motion of a movement, but it keeps the integrity of movement pattern instead of promoting compensations to get it done. For instance, you can place a stack of blankets under someone’s knee to help them perform a vertical shin lunge rather than having them press their weight forward into their toes and thrust their ribs in order to stand up. If you’re struggling to land on the balls of your feet when you jump, you can practice squatting with your heels off the ground and weight still back as far as possible. If that’s too difficult, you can just try a slight knee bend with heels raised. 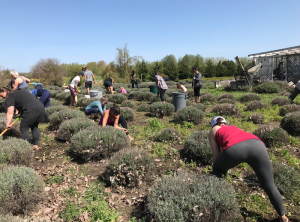 Incorporating various positions and movements into gardening at a lavender farm. 5.Movement culture doesn’t have to compete with fitness culture. There’s no need to choose between identifying as an athlete, runner, lifter, etc. versus a “mover.” You can play the games, do the races, and lift all the things as much as you want, but, if you really want to be fitter, you’re gonna have a tough time if you limit yourself to intentional bouts of fitness. Stop worrying about whether you need a pair of those shoes with the separate toes, whether you eat organic enough, or whether it’s too late for you to change your lifestyle. Just start moving. How should you use your pelvic floor during exercise?